As you look ahead, a massive rock- rugged, jagged and bare, sits in front of you on the middle of the road, ready to knock the senses out of you, devour you. Driving towards your obstruction, for a fleeting moment you think of slamming your brakes, but there is a deep gorge to your left and a wall of rock to your right. So there you are driving high up along the face of a mountain which seems like some sculptor has etched a line on a giant wall of solid rock from afar and caught between the devil and the deep sea. Because if you are going to slam your brakes hard, you don’t know to which side your vehicle is going to swerve. But then realization dawns, why am I worried, BRO must have taken care of it. 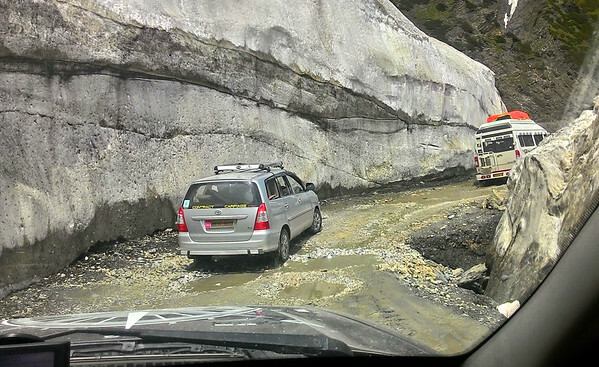 Yes, BRO- Border Roads Organisation is your big BRO when you travel high up in the mountains. Everywhere on the Himalayas or wherever little I’ve been able to visit in Himachal Pradesh, Uttarakhand, West Bengal (the northern most part of the State, the hilly district of Darjeeling), Sikkim or now Jammu & Kashmir, you find BRO fighting against insurmountable odds, against the fury of nature with dogged determination. Every year high up in the mountains , winter comes and freezes everything, sending a chill down to the heart of earth’s crust. All that was built last summer is laid to waste and many places are avalanched out of shape. The moving rivers of ice know their way downhill when temperatures start rising and twist, turn, churn, grind and beat the hell out of whatever comes their way. Many portions of the road that were built last year get damaged and the process of rebuilding starts again after the snow is cleared. So, up in the Himalayas one is struck by this constant road building activity. If one looks at the satellite imagery of the Indian sub-continent, it looks like as if someone has welded the sub-continent to Asia and the Himalayan and the neighbouring few ranges form the seam of the welding. Also look at how abruptly the mountains rise up to the north of Gangetic and other river valley plains. As you go further northwards, after the Himalayan ranges you find the Tibetan Plateau which was formed as the edges of Eurasian plate got elevated as the Indian plate got under it. This high but relatively flat land is called the ‘roof of the world’. 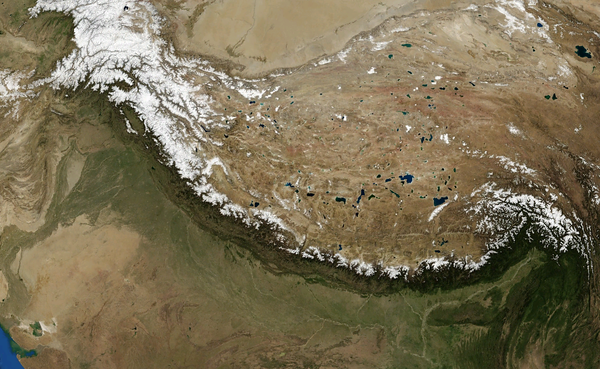 The Himalayas stretch from Nanga Parbat in Jammu & Kashmir to Namcha Barwa in Arunachal Pradesh for almost 2500 kms. In fact it can be better remembered by knowing that the Indus river forms the western boundary of the Himalayas and the Brahmaputra river (known as Yarlung Tsangpo at that place) forms the eastern boundary. It is also thought that the Indus and the Brahmaputra pre- existed the formation of Himalayas and after the collision they circumvented the mountain range on their journey towards the sea. Himalayas contain amazing landscapes & colours, precipices & gorges, the snow clad peaks, the array of waterfalls which proliferate in numbers during the rains, the rapids and numerous streams & rivulets which enjoin to become some of the mightiest rivers on earth, the beautiful undulating valleys, the forests of pine & other trees of cold weather, the bare rocks denuded as much by humans as nature herself and myriad other geographies which take your breath away. Once you start travelling through it, you are left spellbound, you fall in love with it. It’s like the heady brew which is aged and matured for generations to be savoured by you and to get intoxicated by every drop of it...still leaving you with the yearning for more of it. So, this explains my fascination for the Himalayas that borders on obsession for the enchantress and when Debashis (Bana) suggested about the trip I immediately fell for it. Bana did some amazing research from the internet about the route we would take, places to make the night halts, hotels we would like to stay, tools for elementary breakdown maintenance of the vehicle etc. He also procured a tyre repair kit although we were never required to use it during our journey, two big jerry cans for storing emergency stock of diesel and abundant supply of things, which even leaves Gods having their abode in the Himalayas, forget their worries and pass on into a divine trance. Bana made contact with a group who go by the name of ‘Devil on Wheels’. This is a community of bikers and adventure lovers who love to go off the beaten track turning aside little comfort from their journeys, to explore the unexplored. They helped us to make our travel plans ready and take care of the nitty-gritties. Originally four people had consented to be part of this safari on a SAFARI (though I personally didn’t know the other two). But this was two months before the D-day. I was in two minds from the beginning because of certain official commitments and had not applied for leave till 10 days before the start of the journey. Bana was keeping up the tempo by his updates on the travel itinerary regularly, as he had all the time in the world. His toilet building activity was at a lull as they were nearing completion and his wife and kids were packed and transported to Bhubaneswar on their annual summer holidays. A fortnight before the start of the Himalayan rendezvous, one of those unknown guys excused himself from the trip. Three remained and it was thought prudent to add one chauffeur to the list of explorers. A week before the start of the journey, Bana was frantic in making arrangements and I was still non-commital. Four days before, Bana called up and said with his voice almost choking ‘let’s call off the trip’. Now, I was concerned and told him to cool down and tell me what happened. My worst fears were coming true as Bana said the third guy has also excused himself. Then I said ‘Bana, there is no question of going back now as you have made so elaborate preparations and the trip will continue as scheduled even if it means just the two of us'. The start was scheduled for 29th May, 2015 from Raigarh, Chhatisgarh (Bana’s present place of posting). I had to reach Raigarh by 28th May to be able to make the start in the morning of 29th May. But fate had other plans and suddenly an important meeting on my office front was scheduled on 28th May. So, it was agreed that Bana would start from Raigarh as scheduled and I’ll catch up with him at Delhi on 30th May morning. Bana made the start from Raigarh early in the morning at 5:00 am on 29th May’2015 along with his chauffeur, who was seldom given to drive the vehicle. Throughout the day, Bana was sending updates on ‘whatsapp’ and making me impatient. Finally, in the evening as I was waiting at Bhubaneswar Airport to catch my flight to Delhi, Mithun, a close friend of mine who was also an acquaintance of Bana, called up. I pleaded with him to join us in the trip and told him how exciting and memorable it is going to be. Mithun agreed. So, it was planned that he would join us at Leh and be with us on the Ladakh leg as well as our return journey. Meanwhile, Bana continued on his updates and selfies – Mirzapur, Allahabad, Fatehpur, Kanpur, Etawah, Agra etc as he sped along on NH-2 towards Delhi. I landed at Delhi at around 11:00 pm and went to a friend’s place at Ghaziabad, who was also enjoying his sabbatical from family responsibilities. Prashant is an old friend of Bana & mine from our engineering college days and worked & stayed at Ghaziabad. He was in a state of blissful nonchalance as his family also had been packed off to Bhubaneswar for summer vacation. As the eventful opening day drew close, Bana was somewhere between Kanpur and Agra and I was catching up with my old friend over a bottle of rum. We got up very early in the morning at about 5:00 am, as Bana banged on the door. The reunion was ecstatic as the three of us were together probably after 17 years. Of course Bana and I meet quite often and both of us had met Prashant a few times individually in the last 17 years, but never together. Nevertheless, reunions of hostel mates is usually boisterous. Both of us were pretty tired and wanted to catch some sleep, but we had no such luck. Old friends meeting after a gap so long, had lot of catching up to do, with fair amount of leg pulling & banter. We slept for 4-5 hours, woke up and got ready by 1:00 PM, to visit another friend of ours from our engineering college days. Jaggu, is a senior officer in Indian Air Force and was posted at Hindon Air Force base which is nearby. He showed us around the sprawling Air Force base, the tree lined streets, the offices, parks and most importantly the tarmac. We saw some of the finest military planes that India possesses, parked on the tarmac. The defence stations are usually a habitat in themselves because of their very nature- sprawling & protected. Many species of flora & fauna find their way inside and thrive. We were lucky to see a few nilgais, deers & jackals in there. Then all four of us unwound at their Officer’s Club and had a few beers and late lunch. Had a late afternoon and early evening siesta and were ready by 8:00 PM, to meet a few more friends. Bana went to collect the T-shirts and shoes from ‘Devil on Wheels’. The day finally drew to a close at midnight after some more partying & revelry. It was peak summer and very early daylights at Delhi. We got up early and got ready to finally flag off our sojourn at 6:00 am. 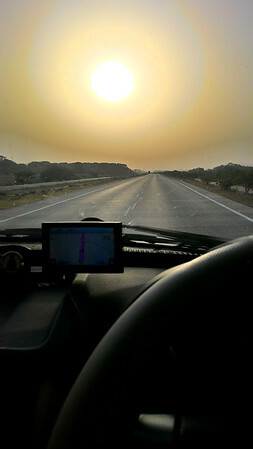 We took the National Highway 1 (NH-1) which joins Amritsar to Delhi and sped on through Haryana little knowing a shock awaited us a short distance away. A Jat policeman, a typical smirk on his face waylaid us near Sonipat for overspeeding. After the ceremonial paper verifications, negotiations were done and things settled for a handsome sum. The road is good and one cannot be blamed for touching 120 kmph in the morning hours. Perhaps it was good for us as our eyes wavered on to the speedometer subconsciously, then onwards, for the rest of the journey. The road is dotted with new generation dhabas every few kilometers, which are impressively built, many having well laid out gardens in front and with fancy names. We decided to have our breakfast of 2-3 varieties of stuffed parathas-aloo, methi & pyaaz at an old style Punjabi dhaba for sake of memories of past. As we sped on through the dusty Haryana towns of Panipat, Karnal, Kurukshetra and finally towards Ambala one thing that struck us was the complete absence of ‘thekas’ . By the time we reached Kurukshetra we were seriously concerned about the lack of these 'thekas' and when we finally enquired about them, we were told that the Supreme Court order few years back for eviction of liquor parlours from NH and it has been implemented whole heartedly in Haryana. But Indians will be Indians and they will find out ingenious ways of hoodwinking the law and brushing the undesirable things under the carpet. So they have opened counters with back to the NH and which can be approached from an adjacent street. The good Samaritan also showed us the nearest one which was hardly 50 mtrs away. We bought our quota of cold beer for the day and some other stuff to be used later on. 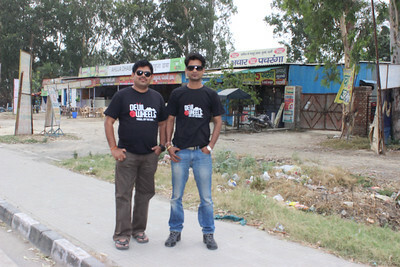 The military cantonment town of Ambala is near the border of Haryana and soon we crossed over to Punjab. But as one drives on these highways, the cities are hardly visible, as bypass roads have been constructed for each of them. On Punjab side we travelled through Ludhiana upto Jalandhar on NH-1 and took NH-1A from thereon. NH-1A infact goes right upto Srinagar. The last town of significance on the Punjab side of the border with Jammu & Kashmir is Pathankot which is located on the foothills of the Himalayas. Pathankot infact sits near the border of all the 3 north Indian states J&K, Himachal Pradesh & Punjab. Pathankot is about 120 km from Jalandhar and Jammu is further 120 km away. Pathankot is also very close to the international border with Pakistan and from there on, the road runs very close to the border till Jammu. Just after Pathankot as we start climbing the hills there is a majestic statue of Lord Shiva on the highway which must be at least 50 ft tall. It was already late afternoon when we crossed over from Punjab into Jammu & Kashmir. It was almost sundown when we reached Kathua, the first town in J& K and our resting place for the night, Jammu was still 80 km away. We became slightly worried as darkness was fast descending, the terrain was hilly and the road ahead was through Samba sector, notorious for occasional friendly exchange of fire. We reached Jammu at about 8:30 pm and with a fair share of trouble finally checked into a hotel to call it a day. Rejuvenated after a sound sleep in the night we set out on our journey towards Sonamarg at the far end of the Kashmir valley. As we started from Jammu, the excitement was palpable as we were to see the lands for which such evocative words of praise have been written. At the beginning, the roads were four laned and such fantastic pieces of engineering marvel that we stopped many times in the first few kilometers just to click pictures of the roads. Snaking its way on the mountains, the two opposite lanes, sometimes alongside and sometimes far apart on two different hills added to the majesty of the beauty that had begun to unfold before us. The barren mountain sides slowly changed to wooded hills as we moved along NH-1A from Jammu to Udhampur and thereon towards Patni Top. The small hill station called Patni Top is slightly off the NH-1A and we decided not to go in there, as time was short and many more hill stations lay in wait for us in Kashmir valley. Stopped at many places on the way to soak in the sight and click photos to capture the moments for posterity. The route is heavily guarded by Indian armed forces due to terrorist activities. At many places, you will find soldiers keeping a watch on their surrounding, from their vantage points, unknown to all. We observed their presence only when we stopped by the wayside and went slightly off the road to attend nature’s call or to shoot some picture. The luxury of the four laning also gave way to two laned mountainous roads and we were poised to enter into the Kashmir valley. Patni Top onwards and right upto Banihal the land is criss-crossed by river Chenab & its tributaries and many times the road travelles beside the Chenab. After partition & first war between India & Pakistan in 1947-48, only one way remained to connect Jammu and Kashmir valley and that was by crossing the Banihal pass which was closed during winters. But a tunnel was constructed by cutting through the heart of Pir Panjal range for 2.85 kms and this makes all weather contact between Jammu region & Kashmir region possible. The tunnel was called Banihal tunnel when it was opened in 1956 but is now known as the Jawahar Tunnel. The tunnel is the lifeline of Kashmir as all supplies and army movements pass through this. It is heavily guarded by army and para-military and gives an amazing experience while crossing because of the sheer length of it, the diffused golden yellow coloured sodium vapour lights giving the feeling of eeriness & the sudden coldness in the air. As the end of the tunnel approached, a speck of white appeared afar which contrasted with the golden yellow setting inside and it grew & grew to suddenly explode into bright sunlight outside. We had covered about 190 km from Jammu... and now entered the Valley. The signs of Kashmir Valley become visible immediately after crossing the Jawahar Tunnel. The hawkers were selling fruits of colder climates like cherries & plums and the more famous exports of Kashmir like willow bats, rugs & shawls near the other end of the tunnel. The journey thereon towards Srinagar is not much different from Patni Top onwards but the spreading out of the open spaces was noticeable. Road was cut on the sides of mountains and deep ravines were alongside at some places but the flat plains were also visible. Kashmir valley is also known as the valley of river Jhelum and the river along with its tributaries form the lifeline of the valley. The Jhelum is the famous ‘Vitasta’ river in our Vedas & scriptures and was called ‘Hydaspes’ by the Greeks. The ‘Battle of Hydaspes’ between Alexander & Porus or Puru was fought on its bank. Originating from a place called Verinag to the east of Banihal, Jhelum flows in a south-east to north-west direction towards Srinagar. Flow of Himalayan rivers in south-north direction is extremely rare and this adds to the myth of Jhelum. The river also forms a great lake within herself – Wular, the largest freshwater lake in India. River Jhelum enters Wular lake from south not far from Srinagar and flows out from west . In other words the river is feeding the Wular lake as well as draining it. Then it moves on a westerly direction towards Muzaffarabad which is the third most important town of J&K but is now in Pakistan occupied Kashmir (POK). The river Jhelum then moves in a north-south direction and along with one of its tributary forms the international border with Pakistan for a few hundred kilometers. But most of this international border is now in POK. Jhelum is also called ‘Jehlum’ and the name has been immortalized in the song of same name from movie ‘Haider’, which is Vishal Bhardwaj’s adaptation of Shakespeare’s Hamlet. The next major town enroute towards Srinagar is Anantnag which is about 50 km from Banihal. Anantnag is famous for the ruins of the temple of Sun God at Martand which was razed to the ground about 4 centuries ago but still the foundation and some walls remain to tell its story. Anantnag is the main centre of manufacturing & trading of traditional Kashmiri handicrafts like shawls, carpets, rugs & wood carvings. This is also the major manufacturing centre for Kasmiri willow bats and you will see lot many shops displaying cricket bats along the highway. There is a place called ‘Sangam’ near Anantnag and three rivers meet to form the Jhelum and river becomes quite wide after this place. The road to the famous hill station Pahalgam starts from Anantnag. We also passed through Awantipora, the ancient capital city (Avantipur) of Kashmir and Pampore, the saffron trading centre enroute to Srinagar. The road from Anantnag to Srinagar was a big letdown as it had not yet recuperated from the massive floods a few months back in Sep’2014. To aggravate it, road widening work was also in progress and the mythical beauty of the valley had greatly diminished. Two springs are past since the flood now, I can only hope that the regeneration process brings back its lost glory. Thanks to our numerous breaks enroute, it was late afternoon by the time we reached Srinagar and we found the city was dusty and it’s beauty greatly diminished. We even found the floodwater marks on the buildings along the road still visible as a muddy line high up on the walls. The intensity of the calamity that befell the people of the valley can only be imagined by visitors like us. Since our destination for the day was still 80 km away, we thought it prudent to let the attractions of Srinagar, like Dal lake with its boathouses & shikaras and Mughal gardens (Shalimar Bagh) a go by. Darkness was falling as the beauty of the valley slowly started to unravel before us after crossing Srinagar. 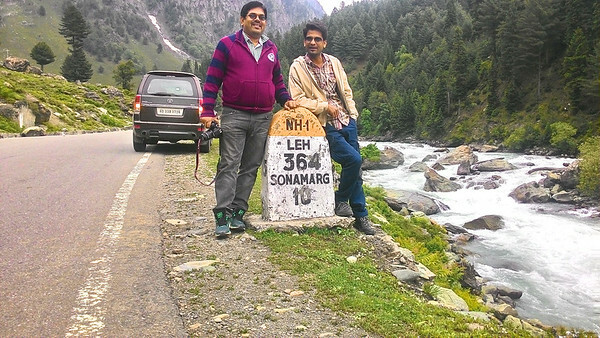 It was almost 9 PM by the time we reached Sonamarg. But shock was in store for us, as GPS & internet was not available and our hotel was not to be found anywhere in Sonamarg. After sometime somebody pointed out from the booking printout that our hotel was at a place called Kullan which is about 15 km downhill of Sonamarg. By the time we came back to Kullan, it was almost 10 PM & very few souls on the road to show us the way to our hotel. A few people who were still on the road, showed us the way to one Hotel Rah Vilas, telling us, it is the same as Farha’s Resort, where we had booked. We almost forcibly checked in at Rah Vilas, insisting that we had booked through internet and their managerial staff will find it out once they come in the morning. Although, we were charged heavily in the morning, but there is no regret for our stay at that hotel. When we got up in the morning, we were just left spellbound by the view from our balcony - the lofty mountains, the pine tree covered slopes and the remnants of the ice of last winter also on the slopes. The view was so near to our room it almost seemed like the backyard of our hotel. After an early brunch, we set out towards our next destination, Kargil. The ordeal of the past night in finding our hotel was in fact a blessing in disguise for us. 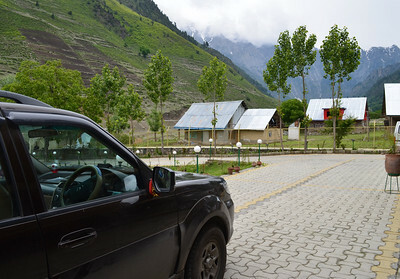 If we had not come back from Sonamarg to stay for the night at Kullan, what sight we would have missed? The journey to Sonmarg was awesome, the picture perfect views and weather is an out of the world experience and I don’t have words to describe them. The road is along a tributary of Jhelum called ‘Sind’ and as we moved along there were breathtaking views of the snow laden peaks of the Himalayas kissing the skies, the icy slopes & pine forests all around us. The un-thawed snow of last winter were still lying at many places along the road and on the mountains. But when you go near them, the work of nature is apparent, the constant trickling of water drops from the snow heaps were accumulating in small pools and draining into some stream after being full. Soon after Sonamarg, the lovely valleys & forests gave way to bare mountain slopes interspersed with ice and the treacherous climb towards Zojila starts. Zojila is hardly 25 km from Sonamarg but the climb is very steep & the roads are very narrow, slippery & bad and it took us more than 3 hrs to cover the stretch. Snow is piled up along both sides of the road as we climbed up on the pass and sometimes it was so thick that it looked like a snow tunnel. Roads are damaged and repair activity is constantly going on and to add to the traffic woes there were thousands of vehicles on these slopes and one wrong move by one driver was leading to traffic jams. Tourists who had come to Sonamarg were also visiting many places on the pass, as winter sports like skiing, snow mobile etc were being organized. 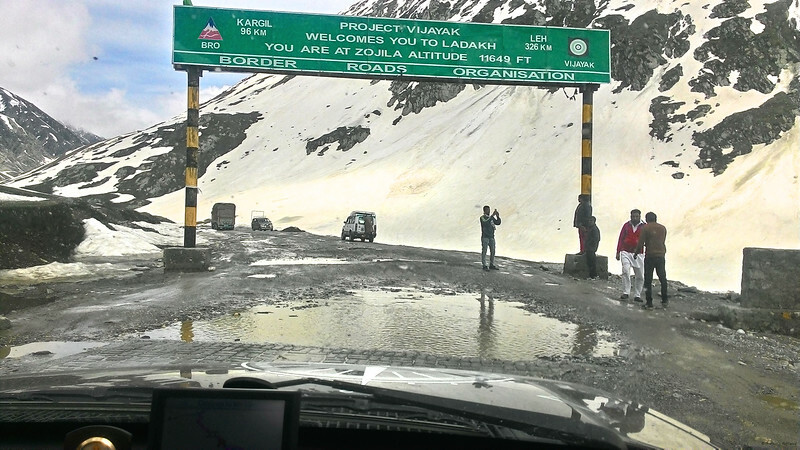 Zojila being the lifeline of Ladakh, there were hundreds of lorries carrying essential commodities along the pass. It was a huge relief by the time we reached the highest point of the pass at 11575 ft above mean sea level, as the tourist traffic had died down and the mountains had flattened out and there were no more treacherous slopes. 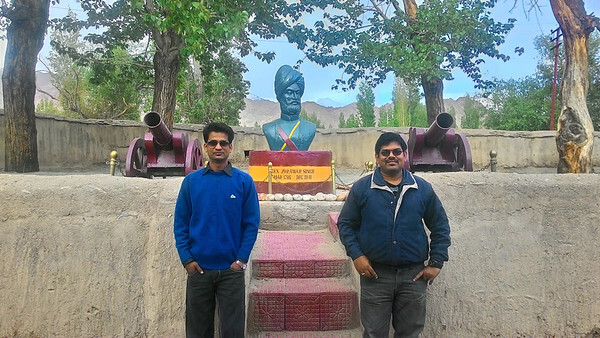 We were now in the Kargil district of Leh region of J&K. The road now moved along a small stream called Dras and after about 35 kms from Zojila we came across Dras town, made famous during the Kargil war of 1999. Dras town is in the heart of Dras river valley and is midway between Sonamarg & Kargil. As we entered Dras town we encountered the sign board announcing “Dras, the 2nd coldest inhabited place on earth”. Infact the winter temperatures of Dras can go as low as -45 deg centigrade. The landscape of the region is striking – you find different shades of grey, brown, blue all around you, but it is almost devoid of any vegetation. As it was early summers in Dras valley, the grass was coming out on the meadows, valleys & mountain slopes. We stopped along to have a feel of the cold, swirling waters of the Dras river. It was so pure, amazing & rejuvenating to wash your face with it. 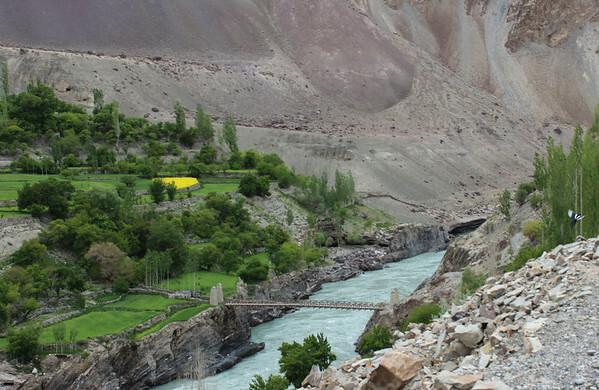 The road to Kargil was along the Dras river and the drive was amazing because of the views of a particular kind of tree which was there in abundance on both sides of the river. The leaves were a light green, the trunks were almost white and they stood strong, thin & erect among the rocks along the water edge and we were wondering which sort of alien tree it was. It was not until much later in Nubra we learnt that these were the famed “poplars”. The drive towards Kargil was made even better by the amazing roads and very little traffic Bana was often tempted to speed beyond 100km/hr. We reached Kargil town late in the afternoon and went about in search of hotels and found a newly built one having wi-fi which was the primary requirement of Bana because of all the photos to be uploaded in facebook. But the amazing day had more surprises in store for us. As we were watching TV & gossiping in the room suddenly there were sound of loud explosions and which went on for quite sometime. At first we wondered what it could be and then thought that since the LOC (Line of Control) was so near, it must be some routine shelling activity in the evening by the soldiers. Then the sounds came nearer and nearer and all around us and we were a little frightened and came out of our room and other guests were also in a similar condition. Seeing the commotion in the corridor one hotel staff came and informed us that nothing is to be feared and the sound was from the “Diwali of Kargil”. Unlike Kashmiris who are Sunni Muslims, the inhabitants of Kargil are Shiite Muslims. One Sufi saint from Persia was instrumental in converting the people of this area to Islam and to this day the devout commemorate the day of his arrival in Kargil by blasting crackers. We were waiting with anticipation for this day as we were going to see the “moonland”. 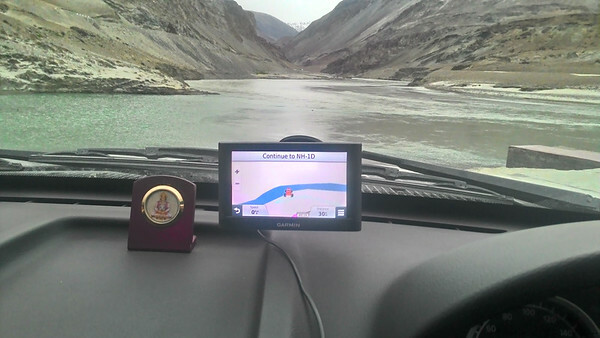 After Kargil, the journey is through Leh district, although the district headquarter town is a good 200 km away. Just on the outskirts of Kargil town a policeman stopped our vehicle and requested us to give lift to one lady. She worked in the education department at a place called Shargole and had been late for her regular bus. The lady was having handsome knowledge about Ladakh and we asked her about our doubts regarding the journey to Leh and beyond. I had heard somewhere about the Aryan villages of Ladakh and out of curiousity, I asked her about it and she said it is possible to go there as it is some small distance from Khalsi on Kargil- Leh highway. At that point there was no way of ascertaining if what she said was correct as there is no internet connectivity on mobiles in Kashmir and the only way to access net is through wi-fi. Luckily enough most hotels in the region have made free wi-fi available to their guests. We made the mistake of not confirming from anybody else about the location of the Aryan villages. As we went farther & farther away from Kargil, human habitations became sparser, and the distinctive “mongoloid” features in appearance of people became more & more apparent. We bid adieu to the lady at Shargole. The next place of importance on our journey towards Leh is Mulbekh which is about 40 kms from Kargil and is famous for its monastery. The monastery is not quite big, but has one rock cut image of Maitreya Buddha which is about 30 ft high. The place around Mulbekh is having good tree cover and apart from the regular willows & poplars which grow all along the river valleys, one can also find apples & apricots here. The river valley has flattened quite a bit at this place giving rise to farming & horticulture in good measure. The next monastery of importance on the highway is at Budhakharbu near Heniskot. 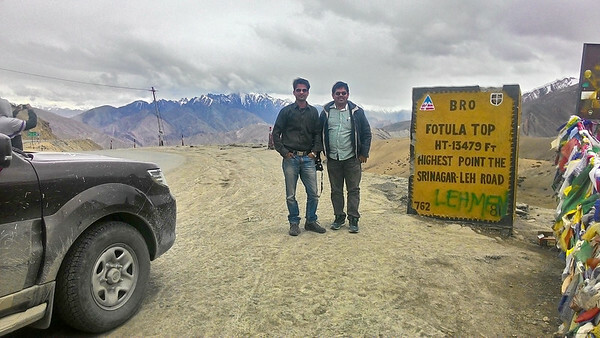 After about 90 km from Kargil, there is the famous Fotula top which is the highest point of Kargil-Leh highway at 13479 ft above msl. The view from Fotula is majestic as you see the bare mountains all around. After spending some time clicking pictures at Fotula we made our descent towards ‘Lamayuru, the heart of moonland’ which is about 15 km from Fotula. One of the largest and oldest monasteries of Ladakh is located at Lamayuru. The view of moonland is actually very weird, the rocks and earth are a rare yellowish colour interspersed with various shades of purple & grey. It has out of the world, almost alien experience and probably because of this, is called ‘moonland’. A desire to see the little known Aryan villages had germinated in our minds and we were not going to stop until seeing them with our own eyes. A few kilometers after Lamayuru, we reached Khalsi where we had to take the diversion towards the Aryan villages. The lady had told us that the Aryan villages are at Baima which is not very off from Khalsi. As we started to take the diversion towards Baima, an army man stopped us and asked to make entry & get permit from their post located at the road junction. When we asked them for the permit, they said that it is called ‘Inner Line Permit’ and it is obtained from District Magistrate’s office at Leh. We tried to reason with them that we were coming from Kargil and there was no way we could have obtained it. They said that the road towards Baima passes close to the LOC and is very near to Battalik, which saw severe fighting during Kargil war. After relentless pestering we could convince them that we were coming from Odisha and our dream was to visit the Aryan villages and they allowed us to take the route with just a plain application. We asked them how far are the Aryan villages and they said its sixteen kms. We took the diversion towards Battalik and immediately afterwards the road was along the banks of Indus. But the river was a good 300 ft -500 ft away although the road runs immediately alongside if the top view is taken. The relentless work of Indus on the mighty Himalayas has made very deep gorges and the blue & white colour of the swirling waters contrasted against the earthy brown & grey colour of the mountains. The road was almost deserted and there were no habitations anywhere to be seen. We stopped at many places to click pictures. This was the first time in my life that I was seeing the Indus, the mighty river which has lent its name to our country to our civilization,’ the Indus valley civilisation’ and even to our religion. It is said that the Persians of the ancient past pronounced ‘Sindhu’ the original name of river Indus as ‘Hindoo’ and the people of the region came to be known as ‘Hindoos’. To say that the sight of the mighty river, roaring, searing the rugged mountains as it continued on its journey to meet the sea, a couple of thousand kms away was awe-inspiring is an understatement. As we moved along that desolate road with nothing but the whirr of our engine and the roar of Indus coming from underneath, a myriad thoughts clouded my mind. After about 18 kms from Khalsi there was no sign of ‘Baima’, but at the bend of the road the most awesome sight of our entire journey unfolded before us. A small valley lay in front of us which was green with wheat fields and some spattering of bright yellow of barley crop and the usual poplars & willows & few other trees were also all around. The bare rock of the mountains surrounded it on all sides and the blue waters of the river flowed on one side deep below. It’s beauty can rival any paradise and we just sat by the road side high up on the river banks, soaking in the sight. I was convinced that this must be the Aryan village and even told a story to Bana about it...here goes “how the ancient Aryans came to India from Caucasus in west Central Asia. While most of them after crossing the Khyber Pass near present day Afghan-Pak border generally went in south-easterly direction towards Punjab, but a few went in easterly direction and entered the mountains and found their way to the grandest river in these areas. They were so smitten by the beauty of the place that they decided to settle down in this inhospitable terrain. Many centuries later, when they were finally discovered, they were like that relic from the past preserved in a time capsule. Their features were quite unlike the people all around them and resembling long lost brethren thousands of kilometers away in western Europe. They are quite tall, some of them even have blue eyes & blonde hair and thus the legend of the Aryan villages was born.” About one km ahead of this beautiful valley down below, we reached a small village along the road thinking that we have reached one of the famed Aryan villages. We met two youths chatting by the roadside and enquired with them about the Aryan villages. Disappointment was in store for us as they said the villages were good 35-45 kms away and with evening approaching we better not venture over there. One of the youth was studying in Pune and had come to his village during Summer holidays and seemed knowledgeable. There was no reason for disbelieving him, but when we expressed that the soldiers told us that Baima was seventeen kms from Khalsi, they said, it must be ‘sattar’ kms not ‘satra’. So with a heavy heart, we decided to turn back as Leh was another 110 kms away and we had many places to visit enroute too. Our exaggerated sense of racial purity & racial superiority has given rise to several anecdotal tales about these Aryan villages. Their origins have been attributed to children of the Greek soldiers of Alexander’s army. But modern genetic research has not supported it as no Greek markers have been found in them. Apart from the story told or propounded by me, there have been others like them who are the descendants of European traders operating on the ‘old silk route’, as they are found at a few places along the route. The Aryan people of the Ladakh region are called ‘Brokpa’ and are found on both sides of the LOC in a few villages. A few of the villages still retain their ancient customs along with Buddhist beliefs but few others have converted to Islam as well. 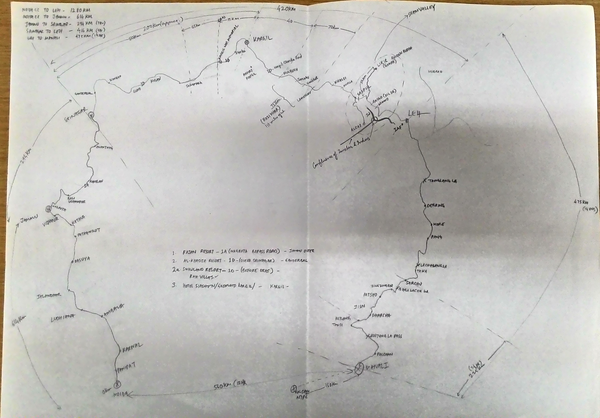 The 5-6 villages on the Indian side e.g. Dah, Baima, Darchik, Hanu, Garkon etc mostly retain their pre-Buddhist animist along with Buddhist beliefs. The Nazi obsession with racial purity has given rise to a unique concept called ‘pregnancy tourism’. The Nazis considered Aryans to be the superior race, the master race with greater intellect. A few German women have been known to travel to these villages and have had escapades with Brokpa men in order to conceive babies with superior intellect & other attributes of the master race. The Brokpas are a part of the larger Dardic people of the Western Himalayas which also includes the Kashmiri, a few tribes of Gilgit & Baltistan in POK, a few tribes of Swat valley in north west Pakistan and few tribes of Nuristan region in eastern Afghanistan. The Brokpas because of their isolation and inaccessibility have intermingled less with their surrounding population and probably retained more of the ancient features. 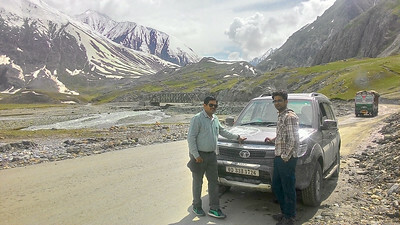 From Khalsi we proceeded on Kargil-Leh highway and the road was more or less along the banks of Indus. The next place of importance being Likir which also has an old monastery and the beautiful statue of golden Buddha alongside it and it towers above all else in the small habitation. Basgow ruins were a few kilometers after our stop at Likir. But the ruins were not so impressive as the name suggested and were only some mass of rock built like a wall. 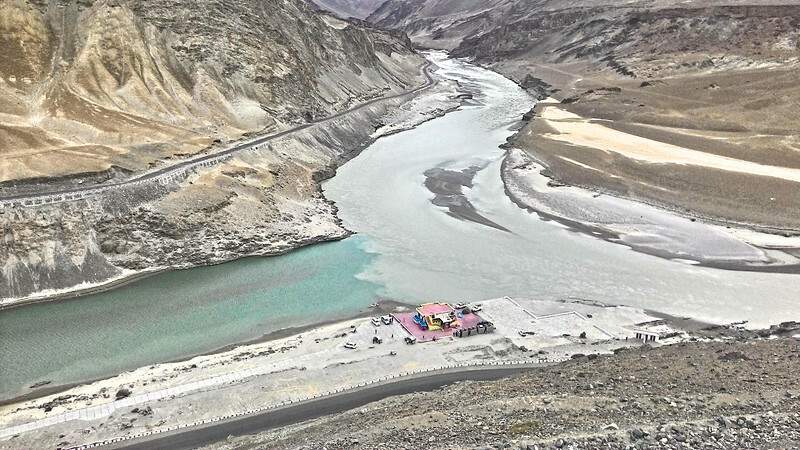 About 50 kms from Leh, there is an unforgettable sight, the confluence of Zanskar & Indus. The two majestic rivers of the region come together at a place called Nimmoo, to form a more formidable Indus from then onwards. The highway passes at a substantial height from the river beds and the view from top is breathtaking. We stood at several places on the highway and gazed on at the confluence and the surrounding bald mountains. There is a loop road which goes down to the confluence and again comes up to the highway. Although it was getting late by now, we decided to take the descent and have a close look at the confluence which was looking amazing from the road above. We were not disappointed. There is a landing deck constructed near the confluence for the rafters. Zanskar river is famous for white water rafting. 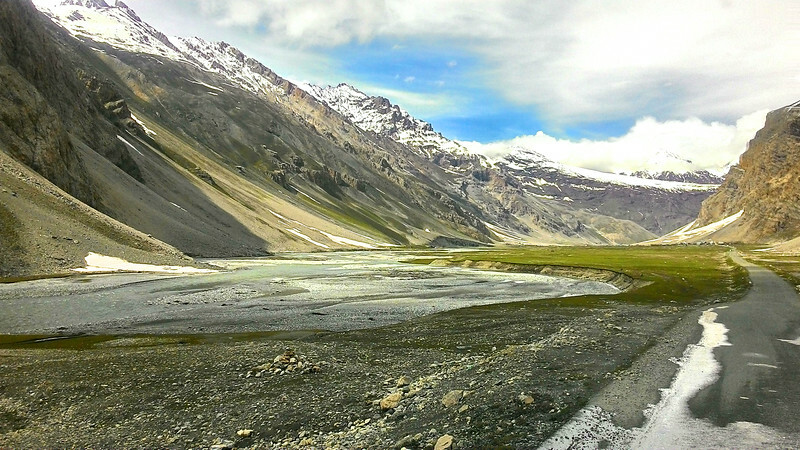 The river completely freezes during the winter and is used by adventurers for trekking to the Zanskar valley. We spent some time at the confluence, washed our face in the icy waters, smoked a joint and moved along. The next place of importance on the road to Leh, is the much hyped Magnetic Hills. The opinion about the hills having magnetic properties is divided and half of the visitors actually believe that the cars having their engines switched off infact climb up on the slopes. The other half of the visitors like me could not find anything magnetic about the hills. In fact we veered off from the highway and climbed half way up on a dirt track on a bald mountain, but still could not feel the magnetism. It was early evening by the time we reached Gurudwara Pathar Sahib. As the name suggests there is a small hillock on the middle of the flat plateau and the Gurudwara is constructed on it. There is a boulder inside the Gurudwara, which as the story goes has the imprint of Guru Nanak Dev’s torso and head on it. During his visit to Tibet in the early part of sixteenth century, Guru Nanak rested and meditated at this place. A wicked demon who lived nearby felt threatened and was angry and rolled a boulder from the hillock to kill Guru Nanak. But the hard boulder turned soft like wax and the Guru’s body sunk half into it and no harm was done. But mark of the Guru’s body on the boulder has stayed to the present day. The demon had a change of heart seeing the holy man and was penitent for his misdeeds and became do-gooder afterwards. But there is another story as well. When construction was going on the highway, the labourers could not remove this stone, as much as they tried. Then the Gurudwara was constructed and has been named as the Pathar Sahib. As with many things on the high altitude India-Tibet border, the shrine is maintained by the Army. This is conspicuous from the housekeeping standards and the attention to details. The rest of the journey was uneventful, for the day and we searched our way to the hotel we had booked for two nights. 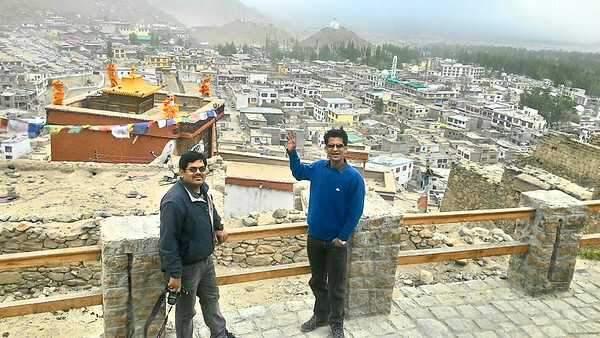 Leh is very overcrowded and it was quite a task finding our hotel in the narrow lanes & bylanes of the city. When we finally called it a day, we realized that it was undoubtedly the best day of our journey, so much was packed in one day. 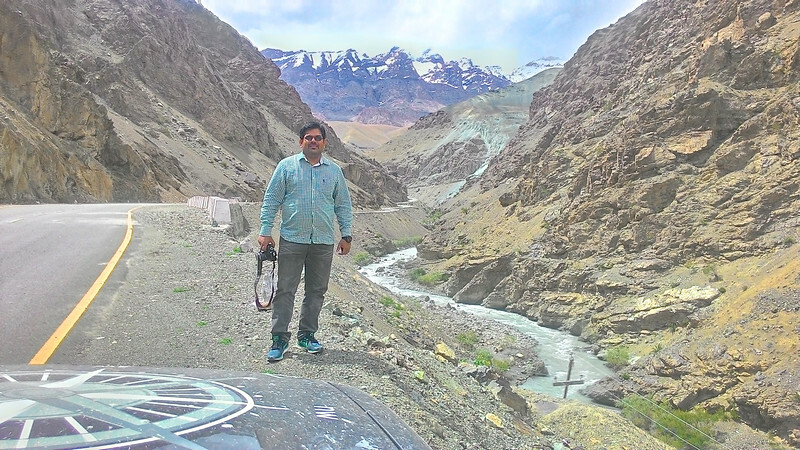 Leh is located at a height of about 3550 m or 11600 ft which is not much compared to Fotula top or to the heights on which we had moved on along roads. But certainly there is breathlessness associated with the air of Leh. Whether it is psychological or actual lack of oxygen I cannot tell for sure. All the travel advisories and past visitors advise for taking atleast a day off for acclimatization and sight-seeing at Leh. Probably that information was having its bearing on us and we felt a little giddy and breathless in the morning. Cantered off at around noon from the hotel, had a sumptuous lunch and then proceeded for local sight-seeing. 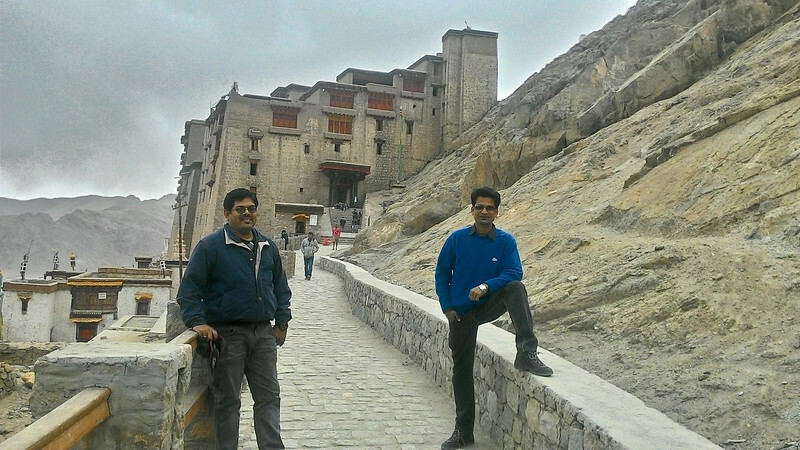 The first place we visited was the majestic Leh Palace which is located on a hillock and the town lies all before it. The palace was constructed in the 17th century by one of the Namgyal kings and has nine levels but not nine storeys. It’s important to understand the difference between levels and storeys in hills. Since it is hard to find flat and plain surfaces on hills, the construction of big buildings are also done on slopes. The front portion of the building may have a few storeys, the ground floor of the middle portion of the building starts at a higher ground than the front portion and may have the same number of storeys as the front portion but ends at a higher level. The rear portion of the building starts on still higher ground and ends still higher. While no portion of the Leh Palace has nine storeys but the building gives an impression of being nine storeys high when looked from a distance. The palace is in ruins and renovation work is going on and many areas inside it are out of bounds for the tourists. There are many artifacts about art & culture of Ladakh. There is also a temple of Buddha inside the palace. The view from top of the palace is really awesome as one can see almost the entire town lying at the feet of the hillock. Hall of fame is sort of a military museum which is a rarity in India but Ladakh region of J&K has two of them. 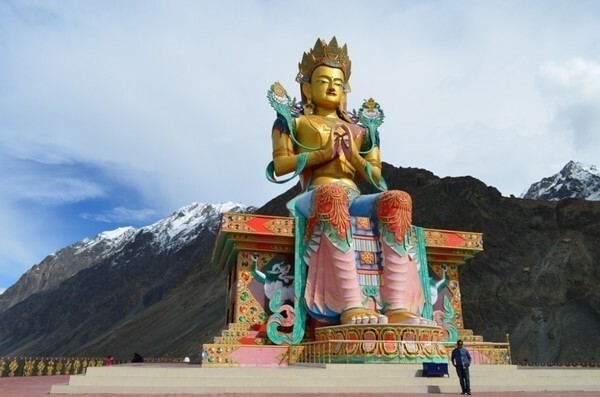 It is located on the outskirts of Leh town and near the airport. It is a museum of military artifacts & exploits as well as cultural heritage of Ladakh. It tells the story of the many war that were fought in this area be at Kargil, Dras or Batalik. It displays the captured artillery pieces of Kargil war, clothing of our brave soldiers posted at Siachen among other things. It also tells the story of the brave warriors who fought and lost their lives defending our motherland. Amidst all the claims and counter claims by India & China over different areas of Ladakh, there is a forgotten hero whose military exploits of nineteenth century laid the basis for India’s claims. It is only apt that there is a military museum inside the fort which was built on his orders at Leh. The fort still houses some offices of the Indian army. The unimpressive look of the fort is also associated with the story of valour & courage of the Dogras and their leader Wazir Zorawar Singh. Zorawar Singh was born in Bilaspur state now in Himachal Pradesh. At the age of 16 he killed his cousin to avenge his brother’s death over some property dispute and escaped from his native state. He was found by one Dogra nobleman at Haridwar and brought to Jammu and was given military training. He became a part of Dogra army of Raja Gulab Singh of Jammu and rose from the ranks to become a Thanedar & wazir because of his dedication, devotion, wit, organizational capabilities & military prowess. Zorawar Singh could have easily become a vassal king but chose to remain a wazir to Gulab Singh, throughout his life. Gulab Singh himself was a vassal of Maharaja Ranjit Singh of Lahore. Zorawar Singh organized military campaigns deep into Ladakh, Baltistan & Tibet and was successful in maintaining territorial hold over most of Ladakh & Baltistan. His campaigns had the tacit approval of Maharaja Ranjit Singh, but after his death in 1839, the Sikh kingdom fell into disarray. Zorawar Singh was mostly on his own with only the support of his mentor Gulab Singh, who also had other commitments of his own due to the power struggle at Lahore after death of Maharaja Ranjit Singh. In one such campaign Zorawar camped near Mansarovar Lake in Tibet having defeated Tibetan army on the way at many places. But winter was fast approaching and the Tibetans saw their chance to isolate Zorawar from his supply lines and defeat him with the support from the Chinese. By the time Gulab Singh sent reinforcements to support Zorawar Singh it was too late. In his last battle in 1841, he fought his way to death and immortality. His decapitated head was displayed on a pole at Lhasa. Emboldened by the small victories, the combined army of the Tibetans and the Chinese pursued the Dogra army till Leh. But the Dogras led by Gulab Singh successfully repulsed the attack and established Dogra hold over Ladakh which continued unimpeded upto 1947. Ladakh was continuosly under power struggle with the Tibetans for the past several hundred years until Zorawar. Sometimes they were able to maintain their independence and autonomy but at other times they played the role of a vassal state and paid an annual tribute to them. The Tibetans in turn were in the sphere of influence of the Chinese and many times paid tribute to the emperor at Beijing. This is probably one basis for the Chinese claim on Tibet & also on many areas of Ladakh. Another reason for the Chinese claim on Tibet was that one Dalai Lama was born in the Chinese mainland i.e. outside Tibet and thus the Chinese argument states that the Tibetans whose identity & culture centres around Dalai Lama are no different from the Chinese and thus their territory also belongs to China. The museum inside Zorawar Fort has several displays of arms & ammunitions of that period and the stories I have recounted are written in detail. What surprised me was the tenor of writing about the political scenario during those times in Ladakh & Tibet and it seemed sympathetic to the Chinese claims on Ladakh or rather the Indian claim doesn’t seem unequivocal. This kind of writing at sensitive locations like Leh which is frequented by so many foreign tourists, can be termed as callous on the part of Govt of India. We also went around Leh city, its narrow bylanes and did some window shopping as well. We visited the Tibetan market, which has some really interesting artifacts, sculptures, wood-carvings, masks, metal works, jewelry, etc. Both of us bought some semi precious jewelry to placate our wives. I think it’s a must visit for every woman visiting Leh. I also bought one beautifully carved dagger. Another interesting incident happened while we had parked our vehicle at one of the lanes near a market place. We were asking for directions and standing beside the SAFARI, when one person approached us and asked where does the vehicle and we, belong to. We asked him why he wanted to know, he said he had never seen the vehicle registration no starting with OR-… & was curious to know. 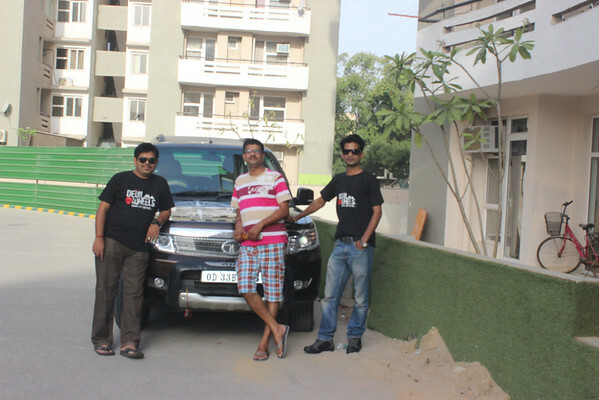 To have some fun we said we are from Ooty and the vehicle is registered there and he went away with a little sadness. Then we saw that he gave some money to his friend who was standing a few feet away. We overheard their conversation and then it became clear that he had bet that our vehicle was from Odisha and his friend was not agreeing. He lost the bet because of our mischief despite of guessing it correctly. Vehicles from Odisha are very rare in this part of India, but we had a chance encounter with another one from our state which we first saw at a petrol pump near Kargil and saw it 2-3 times more in Ladakh area. That vehicle was a Mercedes SUV and a plate was also fixed to it which announced “MP, Nayagarh or Kandhamal”- I can’t recall now.